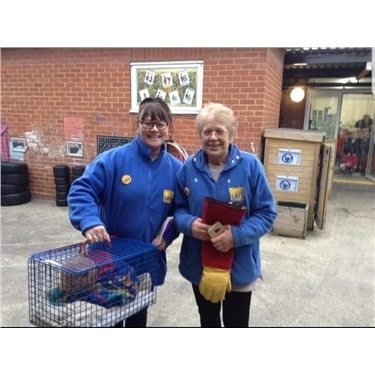 A few days ago, a bedraggled stray cat turned up at Squirrel’s Heath Infant school in Romford, where he sought sanctuary in a playhouse in the playground. The poor creature was in a pitiful state, so the teachers and children covered the playhouse with a tarpaulin to allow him to rest undisturbed, before phoning Cats Protection who immediately sent Deb and Kathy (one of our fosterers) to collect him. Squirrel, named after the school where he was found, was huddled up in a corner of the playhouse, not moving. He was just skin and bone, so weak that he didn’t even put up a fight when placed in the carrier. As they left, the children came out to say goodbye to Squirrel and wish him good luck – they had even made him some lovely Get Well cards. Squirrel was taken straight round to the vet for an examination. He was found to be severely underweight with so little body fat that he appeared much older than his estimated age of 5 or 6 years. He also has a slight heart murmur as well as two broken teeth from a trauma several years ago. Squirrel was settled on a comfy bed, put on a drip and given some food which he thoroughly enjoyed, devouring every morsel. In a few days’ time, Squirrel should be able to leave the vet’s care and go into foster care with Kathy where he will be spoilt rotten. Once he has built up his body weight sufficiently and made a full recovery he will be looking for a loving adoptive family of his own.